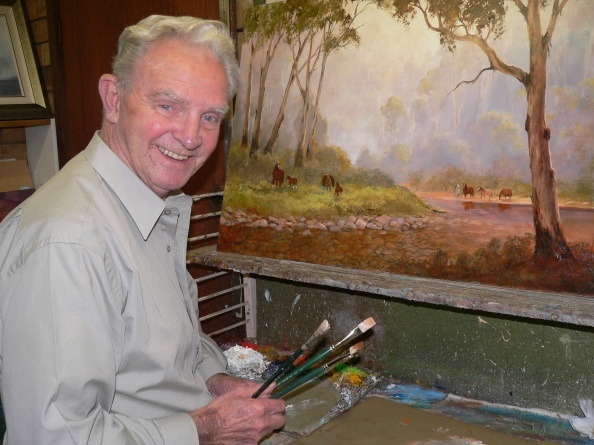 Kevin Best was a well known Australian traditional artist whose celebrated style earned him acclaim worldwide. His underwater rock scenes, mountain backdrops and trademark ‘rays of light’ have elevated his bush landscapes into the realm of ‘romantic impressionism.’ Kevin’s seascapes encapsulate both the power and the tranquility of the Australian coast, often bathed in early morning or late afternoon tones and his sweeping snowscapes have fired the imagination of writers, poets and other artists alike. Uniquely Australian, Kevin’s work explores the underlying stories set within every scene, from a stockmen chasing wild horses down a mountain gully to a fisherman idly watching a lone sea eagle, the foam fanning out before him. Whether they live beneath the brilliant midday light, the burnished, waning sunshine or the golden halo of the moon as it sails across inky night skies, Kevin’s subjects tell an endless Australian tale of beauty, adventure and reflection, holding an appreciative public within the artists gaze. We trust you enjoy exploring the world through Kevin’s eyes.